Web.com TV Commercial – Free Website? Is a Web.com Custom Website Really Free? 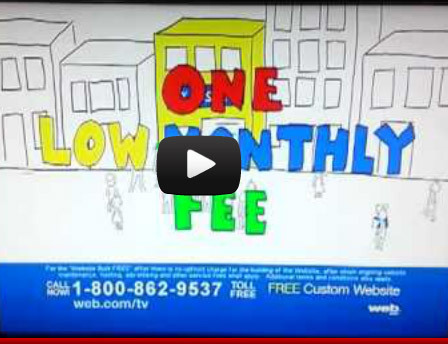 I just saw the TV commercial for Web.com custom websites. They say the word “free” 6 times in this 60 second commercial. Good marketing I must admit and I’m sure it draws in many small business owners looking for an affordable website. However, as I’ve written about before, Web.com’s custom website service called eWorks XL is not free at all. Buyer beware! While the website setup is technically free, the monthly charge is $94.95 so you’ll be paying $1,139.40 per year and if you keep your website for 10 years (and most small businesses will), you’ll pay $11,394 over 10 years for your website. That’s not exactly free. They also claim to promote your website in the search engines. This may be a bit misleading because it appears all they will do is submit your site to search engines which does little to get your site good rankings in the search engines. In order to get any reasonable traffic through competitive keywords in search engines, it will take more than just submitting your website to search engines, which can be done quickly for free. I’m not making any comment about the quality of the website they may build for you. It may be great for all I know. Just make sure you are aware of the cost. I have many people contact me who get websites with these large companies based on promises on commercials and promotions like these only to find out that they are not all they’re cracked up to be!